Drum Corps International staff member Joe Courtney celebrated his retirement on Monday after serving as the organization's warehouse manager for more than 10 years. Prior to and during his tenure with DCI, Courtney has served as a marching music journeyman, spending more than five decades in a plethora of roles including performer, instructor, administrator, judge and contest coordinator. A Chicago-area resident for the majority of his life, Courtney's interest in and love for drum corps may not have blossomed without the absenteeism of one of his baseball teammates when he was 18. Courtney said, "When our center fielder started missing a number of our practices and games, a few friends and I tracked him down at the local VFW post where he was rehearsing with a corps." Soon enough, he says they were recruited into the group's ranks as members of the Winfield Scott Rebels of Maywood, Ill. His other affiliations as a performer and instructor have spanned a vast number of Midwest drum corps and color guard units including the Berwyn Blue Knights of Berwyn, Ill., the Diplomats of Chicago, the Vagabonds of Bensenville, Ill., the St. Alexis Vikings of Bensenville, the Highlanders of Elmhurst, Ill., and the Queensmen of Kenosha, Wis. He also served in several roles with the Midwest Color Guard Circuit and was inducted into the All American Judges Association's Hall of Fame. With his burgeoning drum corps knowhow, Courtney took it upon himself in the late '60s to found a group in Elmhurst, Ill. called the Vaqueros. What started solely as a color guard unit, quickly developed into a group sponsoring several color guard groups and eventually into a full drum corps ensemble, which he served as director of until 1983. "Believe it or not," Courtney says, "we purchased the first set of horns, drums and uniforms to start the group from a defunct senior corps for only $1,500!" After the Vaqueros, Courtney began working with DCI Hall of Famers Bob Briske and Ernie Zimny on the contest crew at DCI events. He was tapped at the 1990 World Championships in Buffalo, N.Y. for his expertise with computerized spreadsheets to keep track of scores at the Individual & Ensemble (I&E) Competition. He eventually became the chief coordinator of I&E, a role he has held up through this past year's World Championships in Indianapolis. 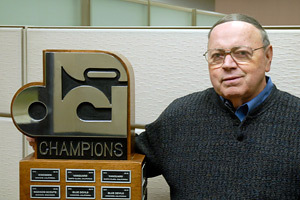 In 1999 Courtney was hired full-time to head up Drum Corps International's warehouse operations where he oversaw deliveries from DCI vendors, coordinated shipments of merchandise to fans around the world, and tackled various event management duties including the annual distribution of adjudication materials to DCI's national network of Tour Event Partners, among a wide range of additional responsibilities. "Joe's service as a DCI staff member has been extraordinary," said DCI Executive Director Dan Acheson. "He has been a quiet force behind the scenes here in the office willing to do whatever it takes to support the drum corps activity—always without condition." Courtney already has a busy retirement planned, staying actively involved over the next several months as a timing and penalties judge at Winter Guard International events, with future plans to establish an association in the Chicagoland area for marching percussion ensembles. "It is safe to say Joe has worn every hat imaginable throughout his years in drum corps," Acheson says, "and while he will no longer be wearing his staff credentials on a day-to-day basis, it is refreshing to know he will remain active in various other roles."